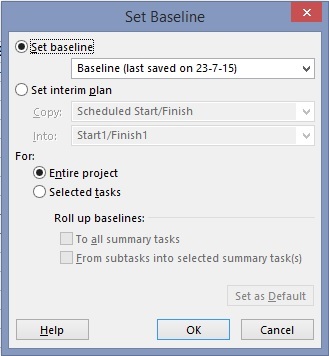 Home / baselines - starting with MS Project - task management / What exactly is a baseline? The baseline of a project is a copy of the project schedule as it was the last time your schedule was agreed upon. Saving this information allows you to compare the actual project progress against the planned project progress at any stage. Once the project schedule has been baselined, all information that is entered (i.e. your actual information) will be compared to the original information. What MS Project actually does, is making a copy of all the values in the left column in below table, and copying it to their baseline equivalents. Current baseline (BL) – The latest agreed baseline is set to reflect the latest agreed project plan as agreed with your customer (or +1). Initial baseline (BL 1) – The initial baseline is taken in line with the initial PID approval and is set at the start of the project. This is the historical starting point. Note that when you start a project these baselines are the same, but if you encounter the first big change and you agree on a new plan with your customer (or +1), these will start to deviate. Baselines 2-9 (BL 2-9) – After your first big change when you agreed to set a new baseline, you will start from baseline 2 onwards. Each time, you should also reset the current baseline, as this baseline will then be ‘current’. Your baselines 1-9 will then become a ‘track record’ of approved schedules at a given moments in time. Tracking baseline (BL 10) – We also recommend to use a ‘tracking baseline’. This baseline can be set and updated at any time and provides a tool that helps to track changes over the next planning period. It is an ‘unofficial’ baseline that you can use as a means to see changes quickly. That is why we will use this baseline every time at the end of the step, when you just completed an improved and more mature schedule. This way you can easily see if (and where) the matured schedule deviates from the previous version after you have incorporated more intelligence. How to set and show the baseline? The video clip below shows how to set the baseline and how to show the baseline in the Gantt chart. Please note that the grey bars in the Gantt chart represent the current baseline (BL) and the blue bars represent the actual information of the tasks. Obviously, in this example there is no deviation between the BL and the actual information. When you hover with your mouse over these bars in MS Project (in the Gantt chart), you see which information is displayed by the bars. ← Do you know all link types in MS Project?